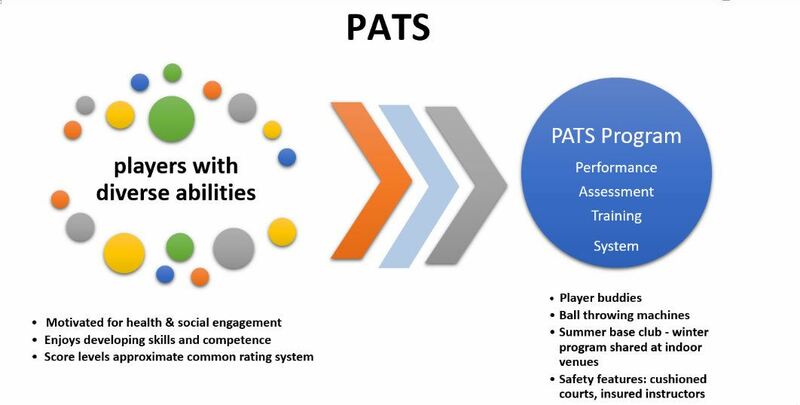 PATS is a new program designed to give new to experienced players a structured and supportive framework for improving 8 core pickleball strokes. A SIMON ball throwing machine is used to feed balls to each player (4 players per session). The four players become "Player Buddies" and are assigned the task of giving stroke feedback to each other. The Player Buddies are given a brief explanations of proper shot techniques. As each player takes their turn on the SIMON machine, their strokes are assessed by a PATS Trainer with input from "Player Buddies". Their stroke (forehand, backhand, dink etc.) scores are recorded so they can see what progress they are making. Player scores are stored online and accessible to the players. After one hour of PATS (each player hitting approximately 100 shots each) the 4 Player Buddies can play a round of pickleball matches on our other court. When players have their stroke level scores for all 8 stroke areas, they are able to seek out players with peers having similar stroke level scores. This feature reduces discomfort that comes with playing above or below your stroke abilities. The PATS program design grew from our experience developing the ACTC Pickleball program which was funded by a 2015 seed grant from the New Horizon's for Senior's Program. The PATS program is developmental. This means it will improve as we evaluate the various program activities and desired outcomes. Coordinate the sharing (lending) of the SIMON ball machine and PATS Trainers/volunteers with the participating recreational venues.